Never been to Mercury you say? That was the question Reggie & Babbette asked themselves and extended their .honeymoon. by getting ever closer to the sun. And like Iccarus, run the risk of geting burned. Back on Ceres, still grieving the loss of her family, Emily Rose finds coping with the stress that comes from great trajedy more difficult and confusing than she ever might have imagined. And the Guzman brothers enlist an old friend to mount a resuce mission on Terra. 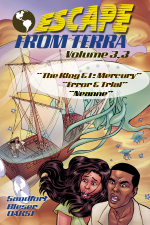 The thrilling adventures of life in the belt continue in volume 3.3 of ESCAPE FROM TERRA!